Dr. Hancock is a Neuroradiology Fellow, and Dr. Quencer is Chairman, Department of Radiology, and The Robert Shapiro M.D. Professor of Radiology, Jackson Memorial Hospital, University of Miami Hospital and Clinics, Miami, FL. Dr. Falcone is the Executive Clinical Dean, Florida Atlantic University, Boca Raton, FL. 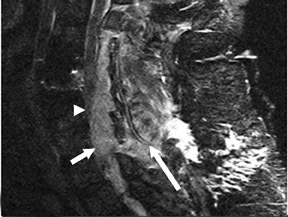 Image interpretation of the postoperative spine presents signiﬁcant difﬁculty because of the various types of surgery performed, new surgical devices employed, different imaging techniques used, and limited clinical information available at the time of image interpretation. The radiologist must understand the many different postoperative spine imaging presentations in order to accurately convey clinically important but often subtle ﬁndings. 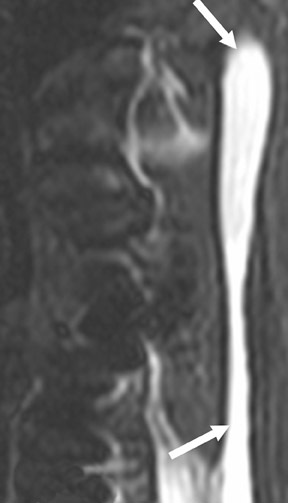 In this article, we will discuss and illustrate some of the common and uncommon imaging ﬁndings in the postoperative spine, with a particular emphasis on the uncommon cases—speciﬁcally, retained surgical material with associated clinical sequelae, including gel foam, dural autograft, and catheters. 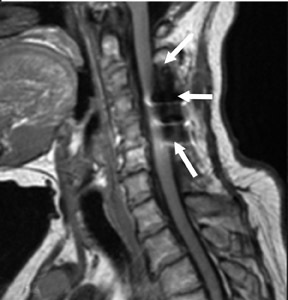 The article will also address magnetic susceptibility artifacts and dislodged surgical hardware, as well as how to distinguish between inﬂammation and infection and between scar and recurrent disc herniation. Another topic covered is the common dilemma of delineation between postoperative ﬂuid collections (including seroma, abscess, and pseudomeningocele). 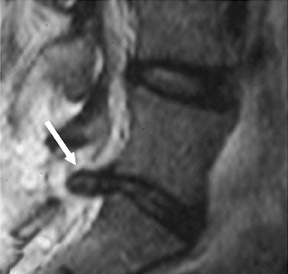 This article reviews several manifestations of postprocedure and postoperative spine imaging with a focus on the challenges and pitfalls that are often encountered. Spine surgery was ﬁrst contemplated by the ancient Egyptians and was later advanced by the Greeks and Romans.1 Many of their works were preserved during the Dark Ages by Arabic and Byzantine translators and were rediscovered during the Renaissance.1 Major impediments to progress from Hippocrates’ era until the 19th century included the lack of antiseptics, inadequate anesthetics, and the absence of medical imaging. With the development of radiography, it was possible to visualize the effects of surgery and the consequences of intervention, and to document the presence of disease. The ﬁrst successful spinal fusion was performed in 1911 to reduce pseudoarthrosis. This was followed by autologous interbody bone grafting in 1933; transfacet fusions in the 1940s; distraction Knodt rods in the 1950s; Harrington rods, methylmethacrylate, and transverse process plate fusion in the 1960s; Luque rods and sublaminar wire in the 1970s; and intrapedicle screws with rod ﬁxation in the 1980s.2 A medical industrial complex surrounding spinal surgery has arisen as a direct result of the introduction of computed tomography (CT) and spinal magnetic resonance imaging (MRI).3 This growth in surgical intervention has in turn created an increase in the demand for advanced imaging for preoperative planning, intraoperative evaluations, immediate postsurgical assessment, and postoperative care. 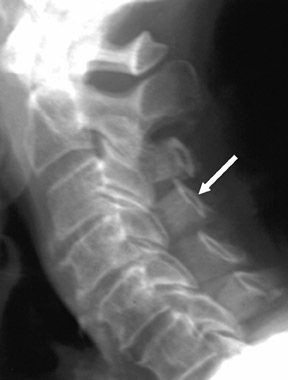 Postoperative evaluation of potential complications (such as retained surgical material, infection, pseudomeningocele, seroma, hemorrhage, loose hardware, compromised hardware, fracture, and pseudoarthrosis) plays an increasingly important role in the radiologist’s daily interpretation of the postoperative spine. 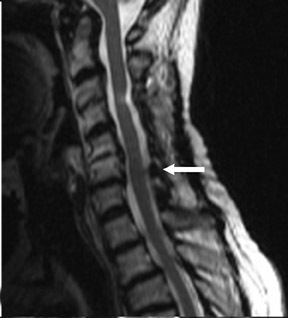 Multiple artifacts may complicate the interpretation of spine imaging, and these artifacts can arise from chemical shift, motion, magnetic ﬁeld nonuniformity, magnetic susceptibility and incomplete fat saturation.4 A textbook would be required to provide a complete compendium of postoperative imaging ﬁndings; therefore, this article includes several of the more interesting and challenging presentations. 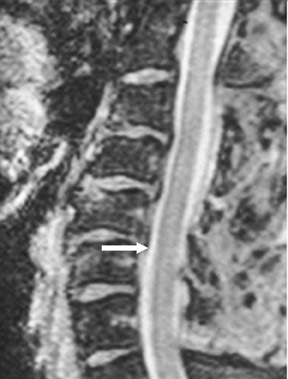 The myelographic agent that was used prior to the availability of water-soluble agents (Pantopaque, Lafayette Pharmaceutical, Inc., Lafayette, IN) could be retained within the spinal canal for years or even decades, depending on the volume used.6 Adhesive arachnoiditis may result as a complication of persistent Pantopaque (Figure 2), which can cause meningeal thickening and hyalinization of the arachnoid.7 The nerve roots may adhere to themselves and/or the dural margins.8 Arachnoiditis may occur in the postmyelographic state, particularly if bloody cerebrospinal ﬂuid (CSF) is present. 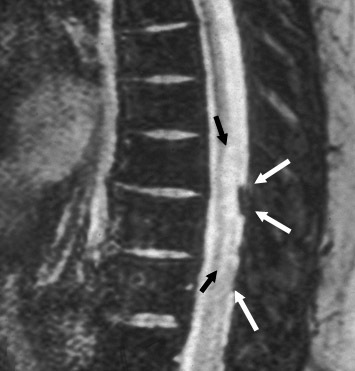 Magnetic susceptibility artifacts are frequently encountered in the postinstrumented spine; particularly when GRE sequences are used. Gradient-recalled echo allows for a signiﬁcantly decreased acquisition time; however, T2* ﬁeld inhomogeneities are worsened with GRE because of lack of a refocusing RF pulse.14 Therefore, gradient-recalled echo imaging can be used in certain applications to not only limit acquisition time but also to search for otherwise subtle foci of magnetic susceptibility such as paramagnetic blood products, air/water interfaces, or calcium deposition.14 Magnetic susceptibility due to neurosurgical hardware is increased at higher ﬁeld strengths and, therefore, the ferromagnetic properties of spinal hardware are ampliﬁed as the ﬁeld strength is increased. 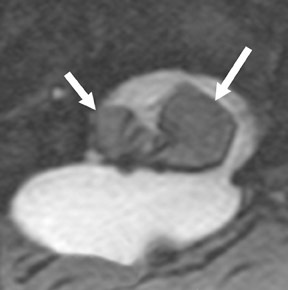 The use of fast spin-echo (FSE) T2-weighted (T2W) imaging is preferred in these patients. Phased-array coils with parallel imaging, high bandwidth, and relatively long echo train FSE sequences can be used to further reduce magnetic susceptibility.14 This fact should be taken into special consideration when comparing scans from 1.5T and 3T magnets (Figure 4).15 Artifacts may be signiﬁcant enough, even with the use of FSE techniques, to limit the evaluation of the spinal canal and the surrounding structures. The removal of herniated discs is one of the most common indications for spinal surgery. Knowledge of the patient’s detailed surgical history is essential, as there may be little evidence of postprocedure changes to indicate any prior operations or interventions. 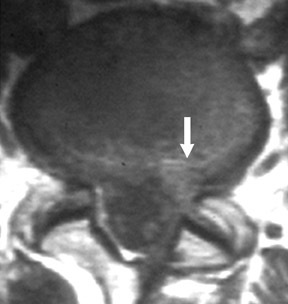 Various terms have been used to describe disc disease in an attempt to improve understanding of the conﬁguration, degree, and location of disc pathology.19-24 Postsurgical ﬁndings may include recurrent disc herniation, residual disc material, scar formation, infection, hemorrhage, or a combination of these entities. 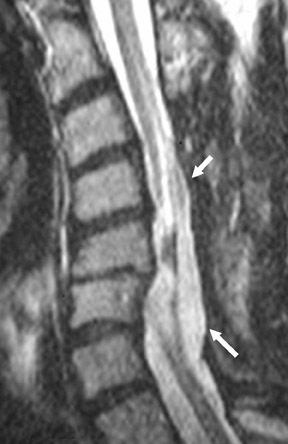 The hallmark sign distinguishing postoperative scar from recurrent or residual disc herniation is the pattern of enhancement. 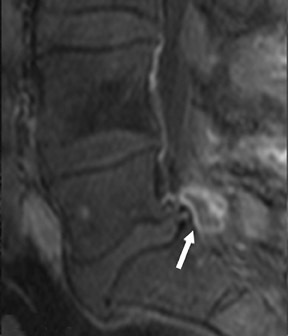 Scar tissue tends to enhance homogeneously, while disc herniation tends to enhance peripherally (Figure 6). 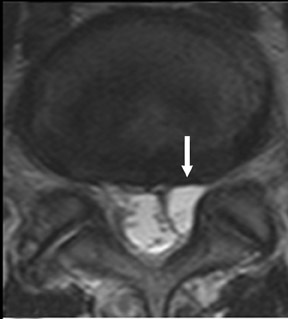 In the early postoperative period (less than 3 to 6 months), it may be impossible to distinguish peripherally enhancing scar type changes from recurrent/residual disc herniation. Postoperative ﬂuid collections are frequent and must be differentiated from seroma, hemorrhage, abscess, and/or pseudomeningocele. 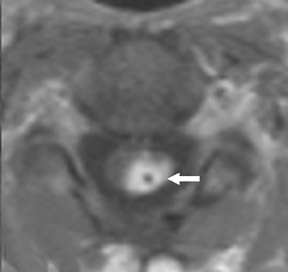 Identiﬁcation is critical because of adjacent vulnerable neural structures and potentially serious sequelae of delayed or inappropriate treatment25–27 Hemorrhage may be identiﬁed by observing a blood/serum level on cross-sectional imaging, measuring HU on CT, and/or evaluating the MRI sequence signal characteristics that are indicative of blood products.28 A hemorrhage may be complicated by a superimposed infection, which may be difﬁcult to distinguish from inﬂammatory scar formation. Pseudomeningoceles may enhance peripherally in a manner that may simulate an inﬂammatory or infectious process (Figure 7). It may be possible to differentiate abscess from pseudomeningocele by observing T1W pre- and postgadolinium and T2W sequences to determine the enhancement characteristics and whether the internal signal exactly follows the signal of CSF.29,30 Pseudomeningoceles do not regularly show the degree of adjacent inﬂammation and enhancement characteristics that are associated with most abscesses. Pseudomeningoceles exhibit signal that should virtually match CSF intensity. Abscesses, conversely, are expected to display lower signal intensity on T2W sequences and higher signal on T1W sequences because of intermixed proteinaceous products. 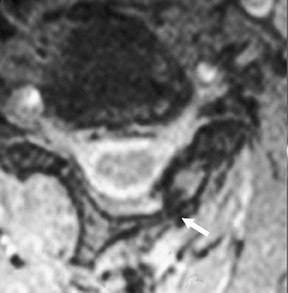 Infrequently, pseudomeningoceles reveal the site of a leak through the dura and are seen as low signal that represents dephasing of ﬂuid due to ﬂow. A focal region of infectious inﬂammation, also known as a phlegmon, often precedes frank abscess formation and may enhance with characteristics that are difﬁcult to differentiate from recently formed scar tissue or tumor. 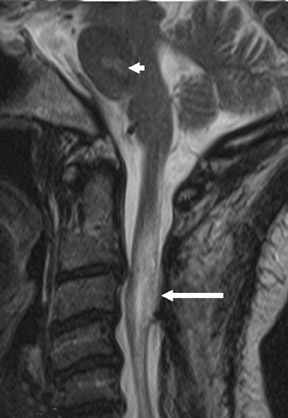 An abscess typically presents in an epidural location; however, it may also present in a subcutaneous or intramuscular position or in the intradural space or disc space, and/or it may involve the ligamentum ﬂavum or lie within the cord. 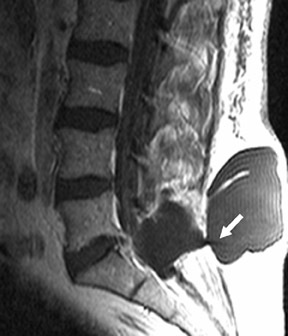 An abscess often appears with a thick rind or capsule of inﬂammatory tissue that enhances avidly.31-33 Spinal epidural abscesses have been shown to occur more commonly in the lumbar spine. In these abscesses, 72% of cultures reveal gram-positive organisms with Staphylococcus aureus as the most common culprit (45%).33 Figure 7F depicts a peripherally enhancing epidural lesion compressing the cord that was culture-positive, consistent with abscess. 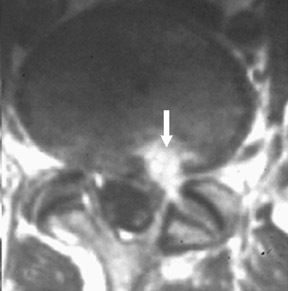 Dural grafts are used for the repair of some congenital malformations, following dural resection, or in cases requiring enlargement of the dural sac. 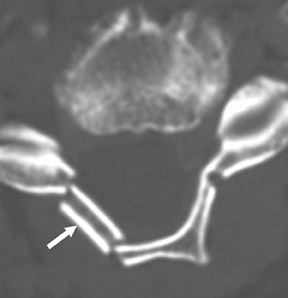 It is important to recognize the expected presentation of a dural graft (Figure 10) and to differentiate it from other potentially associated complications, such as scar tissue, complicated pseudomeningocele, infection, or CSF leak.40 It is essential that the radiologist is familiar with the patient’s surgical history, since this presentation may be inadvertently interpreted as an inﬂammatory or infectious process. 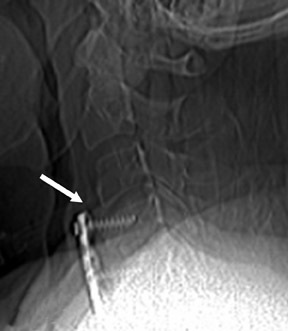 A complicated postoperative spine may include multiple surgical hardware revisions, hardware compromise, complicated ﬂuid collections, tumor recurrence, subsequent osteoporotic insufﬁciency fractures, a mixture of the above, or other complications. Figure 11 displays one example of the plethora of potential complicated postoperative spine presentations. 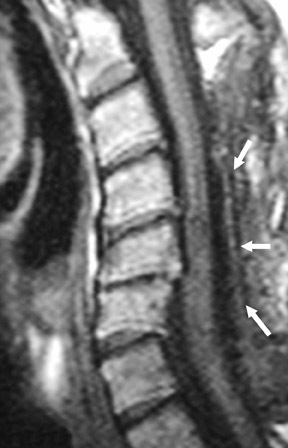 Interpreting postoperative spine imaging requires a systematic approach and knowledge of the patients’ surgical history. This approach will allow the radiologist to separate the many possible confounding ﬁndings. Obtaining surgical reports and detailed clinical history can be invaluable in understanding and properly reporting on the postoperative spine. The authors would like to thank Jennifer I. Hui for her assistance with the preparation of this manuscript. Goodrich JT. History of spine surgery in the ancient and medieval worlds. Neurosurg Focus. 2004;16:E2. Slone RM, MacMillan M, Montgomery WJ. Spinal ﬁxation. Part 1. Principles, basic hardware, and ﬁxation techniques for the cervical spine. RadioGraphics. 1993;13:341-356. McDonnell DE. History of spinal surgery: One neurosurgeon’s perspective. Neurosurg Focus. 2004;16:E1. Taber KH, Herrick RC, Weathers SW, et al. 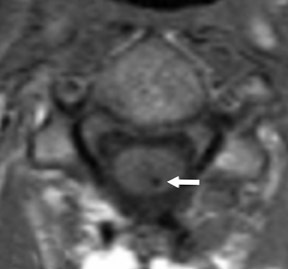 Pitfalls and artifacts encountered in clinical MR imaging of the spine. RadioGraphics. 1998;18:1499-1521. Pospiech J, Kalff R, Pajonk F, et al. The scar tissue protective effect of free autologous fatty tissue transplants. an animal experiment on spinal surgery [in German]. Langenbecks Arch Chir. 1994; 379(3):137-144. Krishnamoorthy T, Thomas B. Unknown case. Spine. 2006;31:1633-1634. Haughton VM, Ho KC. 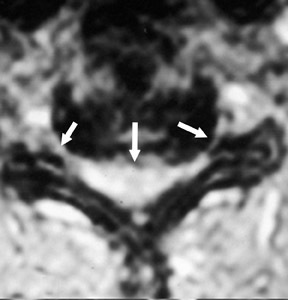 Effect of blood on arachnoiditis from aqueous myelographic contrast media. AJR Am J Roentgenol. 1982;139:569-570. Teplick JG, Haskin ME. 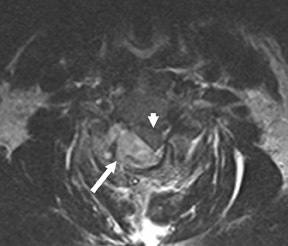 Intravenous contrast-enhanced CT of the postoperative lumbar spine: Improved identiﬁcation of recurrent disk herniation, scar, arachnoiditis, and diskitis. AJR Am J Roentgenol. 1984;143:845-855. Holly LT, Johnson JP, Masciopinto JE, Batzdorf U. 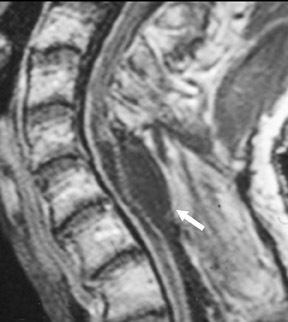 Treatment of posttraumatic syringomyelia with extradural decompressive surgery. Neurosurg Focus. 2000;8(3):E8. Wisoff JH, Epstein F. Management of hydromyelia. Neurosurgery. 1989;25:562-571. Haroun RI, Guarnieri M, Meadow JJ, et al. Current opinions for the treatment of syringomyelia and chiari malformations: Survey of the Pediatric Section of the American Association of Neurological Surgeons. Pediatr Neurosurg. 2000;33:311-317. Greitz D. Unraveling the riddle of syringomyelia. Neurosurg Rev. 2006;29:251-263; discussion 264. Pinna G, Alessandrini F, Alﬁeri A, et al. 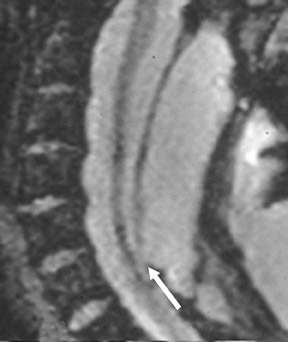 Cerebrospinal ﬂuid ﬂow dynamics study in Chiari I malformation: Implications for syrinx formation. Neurosurg Focus. 2000;8:E3. Cardoza JD, Herfkens RJ.MRI Survival Guide. 1st ed. New York, NY: Raven Press; 1994. Allkemper T, Tombach B, Schwindt W, et al. Acute and subacute intracerebral hemorrhages: Comparison of MR imaging at 1.5 and 3.0 T–Initial experience. Radiology. 2004;232:874-881. Berquist TH. 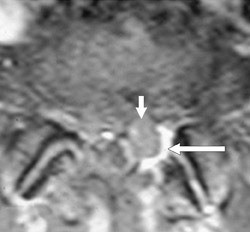 Imaging of the postoperative spine. Radiol Clin North Am. 2006;44:407-418. Gerscovich EO, Greenspan A, Montesano PX. Treatment of kyphotic deformity in ankylosing spondylitis. Orthopedics. 1994;17:335-342. Hunter TB, Yoshino MT, Dzioba RB, et al. Medical devices of the head, neck, and spine. RadioGraphics. 2004;24:257-285. Fardon DF, Milette PC, Combined Task Forces of the North American Spine Society, American Society of Spine Radiology, and American Society of Neuroradiology. Nomenclature and classiﬁcation of lumbar disc pathology. Recommendations of the Combined task Forces of the North American Spine Society, American Society of Spine Radiology, and American Society of Neuroradiology. Spine. 2001;26(5):E93-E113. Wiltse LL, Berger PE, McCulloch JA. 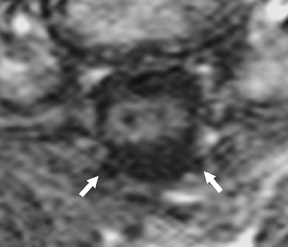 A system for reporting the size and location of lesions in the spine. Spine. 1997;22:1534-1537. 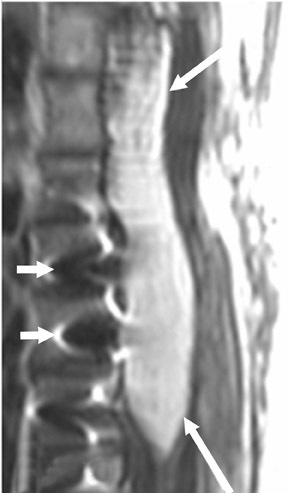 Appel B. Nomenclature and classiﬁcation of lumbar disc pathology. Neuroradiology. 2001;43:1124-1125. Pﬁrrmann CW, Metzdorf A, Zanetti M, et al. 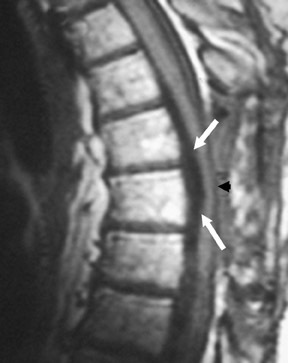 Magnetic resonance classiﬁcation of lumbar intervertebral disc degeneration. Spine. 2001;26:1873-1878. Fardon DF. Nomenclature and classiﬁcation of lumbar disc pathology. Spine. 2001;26:461-462. Chen HC, Hsu PW, Lin CY, Tzaan WC. 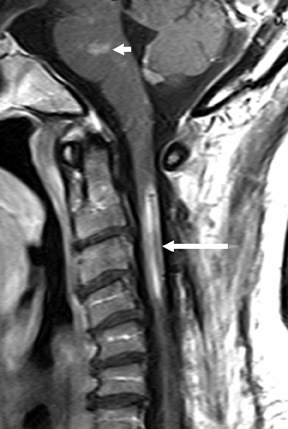 Symptomatic hematoma of cervical ligamentum ﬂavum: Case report. Spine. 2005;30:E489-E491. Croisille P, Vandermarcq P, Ferrie JC, et al. 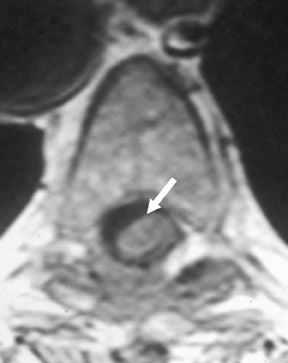 MRI in infectious and spontaneous tumoral epidural hemorrhagic pathology [in French]. J Radiol. 1993;74:399-407. Runge VM, Williams NM, Lee C, Timoney JF. 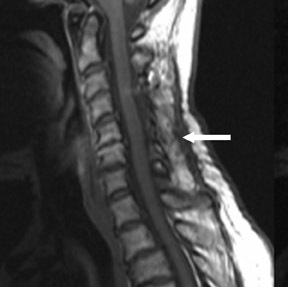 Magnetic resonance imaging in a spinal abscess model. Preliminary report. Invest Radiol. 1998;33:246-255. Quencer RM, Montalvo BM, Eismont FJ, Green BA. Intraoperative spinal sonography in thoracic and lumbar fractures: Evaluation of Harrington rod instrumentation. AJR Am J Roentgenol. 1985;145:343-349. Sarrazin JL. 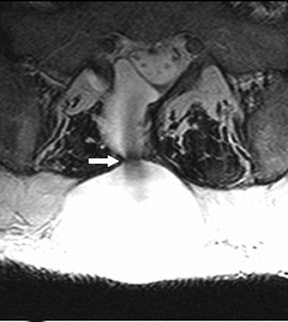 Imaging of postoperative lumbar spine. J Radiol. 2003;84(2 Pt 2):241-250;quiz 251-252. Ross JS. 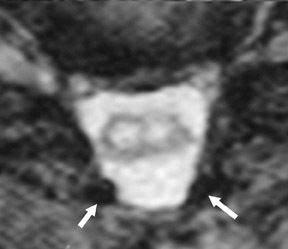 Magnetic resonance imaging of the postoperative spine. Semin Musculoskelet Radiol. 2000;4:281-291. Bluman EM, Palumbo MA, Lucas PR. 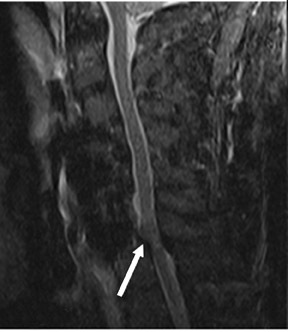 Spinal epidural abscess in adults. J Am Acad Orthop Surg. 2004;12:155-163. Tay BK, Deckey J, Hu SS. Spinal infections. J Am Acad Orthop Surg. 2002;10:188-197. Del Curling O Jr, Gower DJ, McWhorter JM. 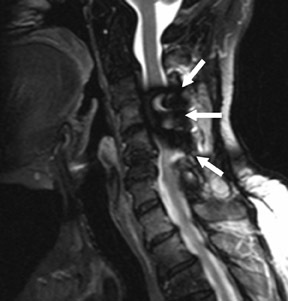 Changing concepts in spinal epidural abscess: A report of 29 cases. Neurosurgery. 1990;27:185-192. Hudgins RJ, Gilreath CL. 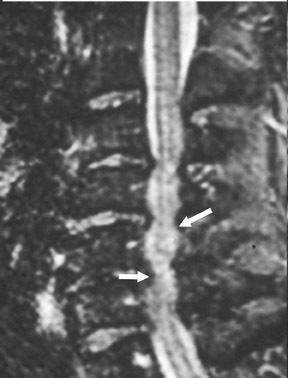 Tethered spinal cord following repair of myelomeningocele. Neurosurg Focus. 2004;16(2):E7. Kostuik JP. Medicolegal consequences of cauda equina syndrome: An overview. Neurosurg Focus. 2004;16(6):39-41. Hansraj KK, Cammisa FP Jr, O’Leary PF, et al. Decompressive surgery for typical lumbar spinal stenosis. Clin Orthop Relat Res. 2001;384:10-17. Xie Y, Chopin D, Hardouin P, Lu J. Clinical, radiological and histological study of the failure of cervical interbody fusions with bone substitutes. Eur Spine J. 2006;15:1196-1203. Schultheiss M, Sarkar M, Arand M, et al. Solvent-preserved, bovine cancellous bone blocks used for reconstruction of thoracolumbar fractures in minimally invasive spinal surgery-ﬁrst clinical results. Eur Spine J. 2005;14:192-196. 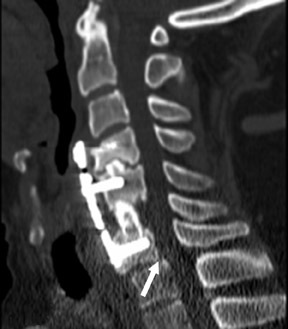 Malca SA, Roche PH, Rosset E, Pellet W. Cervical interbody xenograft with plate ﬁxation: Evaluation of fusion after 7 years of use in post-traumatic discoligamentous instability. Spine. 1996;21:685-690. Martínez-Lage JF, Pérez-Espejo MA, Palazón JH, et al. Autologous tissues for dural grafting in children: A report of 56 cases. Childs Nerv Syst. 2006;22:139-144. 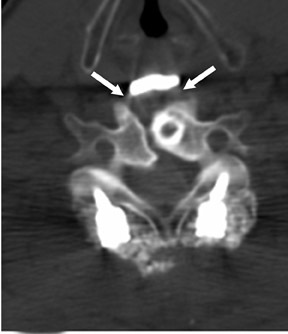 Challenges and pitfalls in postoperative spine imaging. Appl Radiol.